This course helps anyone draft, revise, and review bills and amendments, with lessons especially useful to those who review legislation, prepare reports, or draft legislation and other formal legislative documents. In this course our expert faculty explain the role of the OMB, examine various formats and explore ways to choose the most appropriate one for your issue. This course and any combination of its topics are available as custom on-site training for your organization. We have tailored this course for attorneys, paralegals, legislative counsel, inspectors general, and others in agencies, legislatures, and law and lobbying firms. For more information about how this training can help your staff, please contact our client liaison. This course is also available as a custom program. Suggested Prerequisites Familiarity with Congressional documents, operations and procedures, or our How to Find, Track, and Monitor Congressional Documents course. Other dates: Location in Washington, DC will be announced before course. Our courses are held at these Washington, DC, locations. 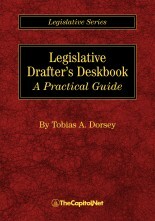 Course Materials Materials include the Training Edition of Legislative Drafter's Deskbook by Tobias A. Dorsey and a course manual. "I've worked on the fringes of legislative drafting & this course gave me real tools to write better legislative changes, amendments & bill text." "This will help me draft legislation for the [Agency] - and we need it." "We have been on the fringe of legislative drafting. This will help us move into this arena effectively." "Excellent! Really enjoyed the practical exercises. Very helpful, excellent instruction." "Contextual and drafting components most helpful - Overview of process as important as drafting. Written materials TERRIFIC!"